Lily is a dancing queen. 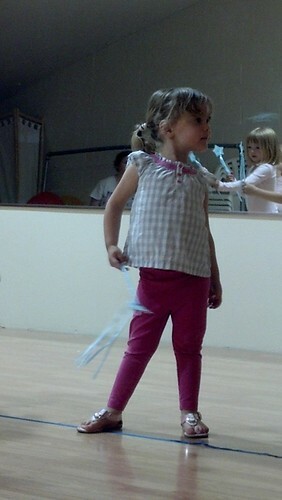 She dances all the time with that three year old sense that it’s the perfect thing to do and you look great doing it. I DON’T dance. 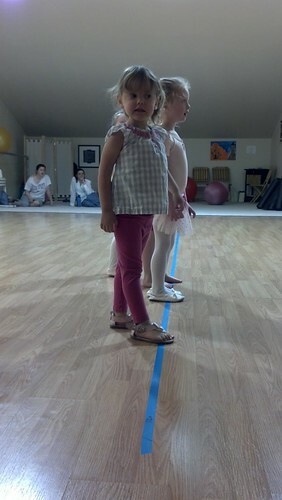 I want to help Lil keep that ability to dance when the mood strikes so I’ve been keeping my eyes out for opportunities. 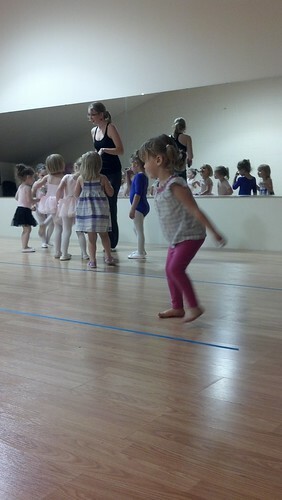 When we first moved to Idaho, Lily and I took a Mommy and me dance class. Lily LOVED it, I tolerated it for her sake. I was going to sign us up again for another round last month, but they don’t run the program during the summer. I was disappointed, but decided to keep my eyes out for dance class groupons and was very excited when I found one a few weeks ago. 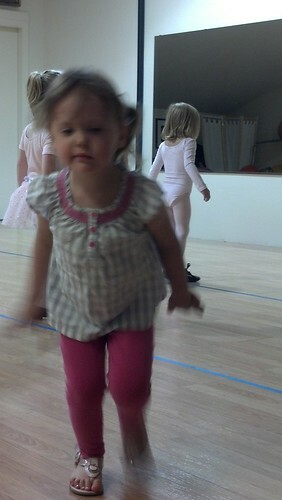 Lily had her first class Tuesday before last. I didn’t find out till the day before when the class was so I didn’t have time to get her a outfit or shoes, but I figured for the first class that wouldn’t matter too much. 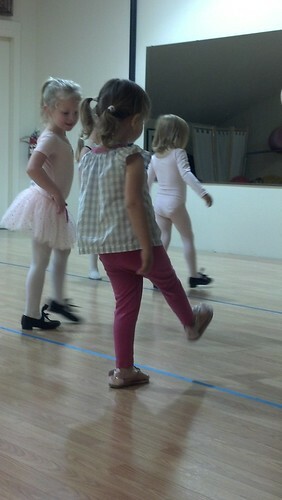 The class is a introduction to ballet, tap and I think jazz. The first class was mostly a gaggle of 3-5 year old girls half listening to the poor teacher and half doing their own thing. When they did listen, it was really cute. When they were dancing it was ballet. Lily was a little (maybe a lot) overwhelmed at first. They don’t want the parents in the room, but there was no way I could leave. I noticed a few of the other parents sitting in a little alcove to the side and more of them kept sneaking up the stairs to steal a look. So at least I wasn’t alone. The first 20 minutes or so Lily was stuck to me like extra strong super glue, but then she started to get really into what the other girls were doing. I kept encouraging her to go and join, she kept trying to drag me along, but I assured her that I’d be right along the wall and not going anywhere. She very tentatively joined the line of girls, but kept looking back to make sure I was there. They learned first and second position. Lily thought it was very cool. I don’t know a thing about ballet or dance in general so I got a bunch of books from the library and they helped us when Lily was obsessively practicing when we got home. At one point all of the girls were suppose to get in a circle with the teacher and hold hands for some dancing. 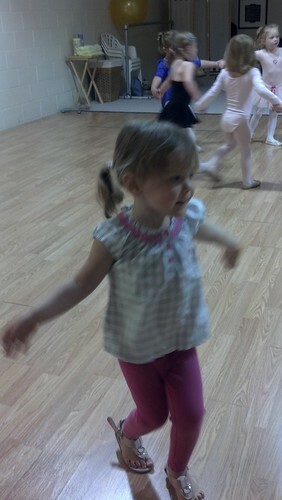 Lily preferred to dance by herself. 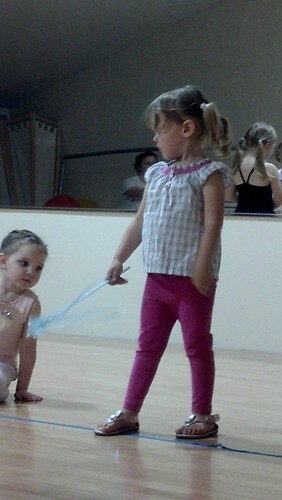 The teacher gave them wands at one point that I think was suppose to be part of some organized dance, but we never got to see it. 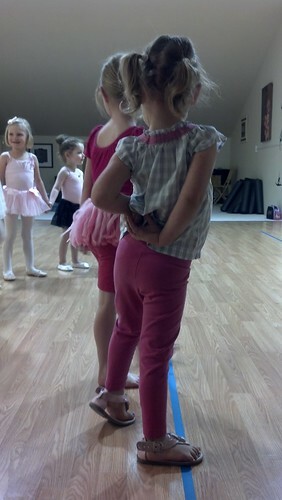 I told Lil to stand on the line and not move till the teach told her to and boy oh boy did she listen. It was really cute to look back at the pictures. I hadn’t noticed how well she stayed on the line till we were driving home. There were probably 20 more pictures of her standing like that. Once the girls all got their wands and the music started all hell broke loose. After a some attempts at wrangling I was very impressed to see the teach just went with the energy and flow of the girls and let them so some free dancing. They loved it and I think it helped to get some of their wiggles out. The teacher got all of the girls lined up at one end of the room to do some kind of ballet kick walk (it has a name, but I don’t know it) and all of the girls did very well. Including mine, which was awesome. 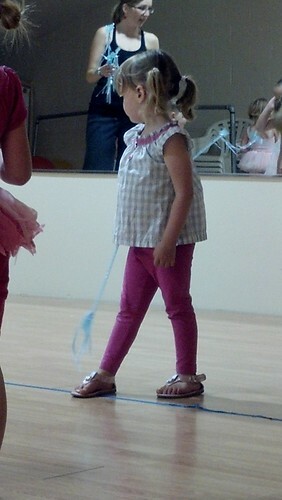 Lil held the teacher’s hand all the way down the line, she didn’t really do any kicks, but she participated so YAY. 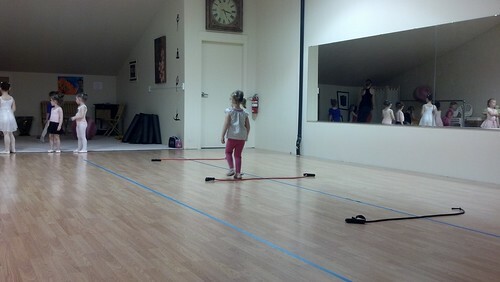 They also had to jump over some bungee cords (another ballet thing I don’t know about) and again Lily sort of did it. Again participation YAY. At one point all of the girls (with the exception of Lily and a few others) put on their tap shoes and they were told to shuffle their foot. 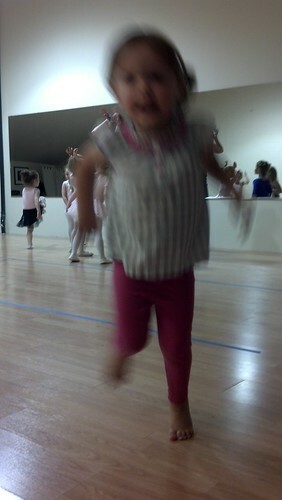 Lily did great, in fact the teacher complimented her and that sent Lil running back to me. Lily doesn’t do well with compliments. I’m trying to figure that one out and how to help her so if you have any suggestions I’d appreciate it. 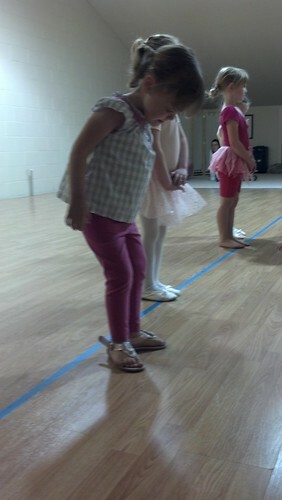 The tap shoes didn’t last very long because the girls kept slipping. I will be very interested to see how this plays out in future classes. At the end the girls all gathered to do some bunny dance. Lil thought that was a blast, but she did it in her own way. I would send her to the group and she’d dance there for a second and then they’d do this hopping thing and she’d hop back to me with the biggest smile. Rinse, repeat again and again. For the entire week after this first class Lily would call me Jenny (the teacher’s name) and have me give her dance instructions. She is loving it and I’m loving watching her dance and strut her stuff. *sorry for the funny phone pictures. I’m just too lazy to bring our point and shoot with me when I know that I’m going to have my phone already and I’m still getting used to my wonderful new phone. The camera and how to take the pictures is very different from my old phone. This entry was posted in Life, Lily, Mobile randomness and tagged Lil, Mobile randomness.